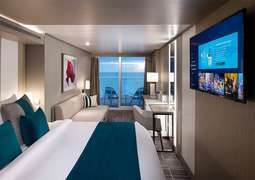 Sister ship to the Celebrity Edge, the Celebrity Apex will launch in April 2020. You’ll step into a world of modern luxury when you board the Celebrity Apex. With innovative new features, a contemporary look and design, and five-star entertainment and dining experiences, the Celebrity Apex will raise the bar in the world of premium cruising. Back is the incredible Magic Carpet, first introduced on the Celebrity Edge. This cantilevered platform floats between decks, transforming into a specialty restaurant, an extended sun deck, and a party and event venue, depending on the location and the time of day. When the ship is in port, the Magic Carpet will make tendering easier. A cruise with Celebrity Apex is anything but ordinary. Art installations which are both stylish and functional can be found throughout the ship, from a whimsical tree-like sculpture in the Rooftop Garden which functions as a stage for live music performances, to two martini-glass-shaped Jacuzzis which tower above the pool deck. Immerse yourself in a world of sensory delights in Eden, or mix and mingle with artists and performers in different public areas throughout the ship – the Edge doesn’t confine art to the theater. 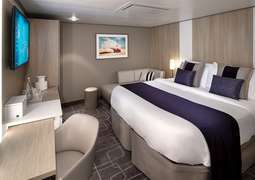 Celebrity Cruises has introduced a range of luxurious and innovative accommodation options on their Edge-class ships. Back are the popular Infinite Verandas, a set of full-length folding doors which, when opened, transform your entire stateroom into a balcony. 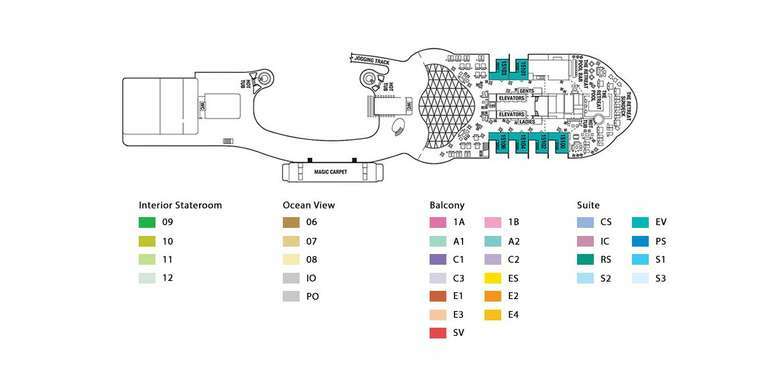 Six categories of suites, plus a range of AquaClass (spa) and Concierge Class staterooms offer the utmost freedom of choice when selecting a stateroom category to meet your needs, and a high proportion of single and connecting staterooms are also available. 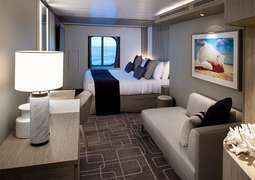 Nearly every stateroom and suite features a king-size bed, as well as Celebrity’s signature eXhale bedding and cashmere mattresses. An exclusive public area, The Retreat, is available only for suite guests. On the Celebrity Apex, Celebrity Cruises’ commitment to culinary excellence is plain to see. With four main dining rooms, seven specialty dining venues, four casual restaurants, and an exclusive restaurant for suite guests, you’ll have your choice of flavors and experiences every night. Each main dining room is devoted to a different part of the world, from the flavors of Tuscany to the textures of Greece. The Cosmopolitan Restaurant is specialized in new American cuisine, with fresh new takes on classic steak, seafood, and salad dishes. Each specialty dining venue is an experience in and of itself, from the al fresco Rooftop Garden Grill to the sushi-centric Raw on 5. Le Petit Chef is a one-of-a-kind art/dining experience in which, with the help of some 3D animation technology, tiny chefs prepare your food right on your plate. And if you’re looking for a casual lunch, the Mast Grill is the perfect place for a burger by the pool. Entertainment on the Celebrity Apex is visionary, innovative, creative – basically everything you’d expect from a contemporary premium cruise line. Dedicated performance spaces such as The Theatre and The Club infuse bold architecture and state-of-the-art technology into every show. Regular live music and movies on the big screen take place regularly on the Resort Deck. And the multifaceted space Eden is home to a variety of performance artists and avant garde art installations. Entertainment is anything but ordinary on this bold new ship. 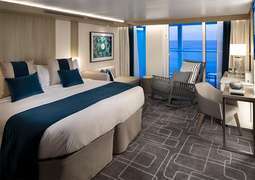 Celebrity Cruises eschews Formal Nights in favor of “Evening Chic:” One or two nights a cruise, passengers don semi-formal attire to dress up for dinner. It could be a knee-length dress, a shirt and slacks, or a smart blazer or sport coat – whatever makes you feel fab. On regular nights, evening attire is smart casual – think dark jeans, polo shirts, or a casual top.